Bahrain consists of an archipelago of 36 islands, the biggest being Bahrain island. It is thirty miles long and twenty miles wide, situated off the east coast of the Arabian mainland. Manama, the capital of Bahrain, is on the main island. Reputedly the ”Garden of Eden” in ancient times, Bahrain has been inhabited for more than 5,000 years. The archipelago is cultivating its own rich heritage and is becoming a focal point in the Gulf for exhibitions, concerts and theatrical performances by cultural groups visiting from Europe and Asia. Bahrain’s Islamic heritage is evident in its wind towers, intricate door carvings, restored houses and mosques, and the crafts still practiced by skilled weavers, boat builders and potters. Geometric forms and decorative Arabic motifs abound on walls, doors, floors and pathways. The unique geographical situation of Iran, which has served as a bridge between the East and the West, together with its diverse climatic conditions and various raw materials available, have caused the flourishing of many arts and crafts in this country in its long history. During the pre-Islamic era from Achaemenid to Sassanian (559 BC – 651 AD), precious items such as textiles, metalworks, jewellery, lusterwares and glasswares were sent from Iran to China and Europe. The adoption and extensive application of geometrical designs on glazed tiles, ceramics, carpets and also metal, wood and stone engravings and finally the making of khatam (marquetry) and enamelled objects, led to the perfection of these designs. Iranian carpets and kilims are famous all over the world. The Hashemite Kingdom of Jordan (al-Mamlakah al-Urdunniya al-Hashimiyah) is predominantly Arab. Jordan has a very rich history of arts and crafts that consists of embroidery, jewellery, weaving, basketry, ceramics and pottery. Embroidery is one of the most important traditional crafts of Jordanian women and one which has, in recent years, been incorporated into high fashion. This art of embroidery has been carried over into the making of cushions in bright colors, which grace the decor of many Jordanian homes. Jewellery has a long history in the Kingdom; stores of gold and silver jewellery dating from Roman times have been unearthed on various archaeological sites. Jordan has many natural clay deposits, which have been used for many centuries in the making of pottery. The Bedouins of Kuwait were, and are known, for their hospitality, pride, honour, courage and endurance. The main areas of the crafts of this country are weaving, pearl diving and ship building. The weaving of wool is the oldest craft practised by the Bedouins of Kuwait. The weaving process is known as ‘Al Sadu’, a term also used for the Bedouin loom. The ‘sadu’, or bedu weaving, has a long history in the Middle East. It is the specialty of Bedu women who made the tent in which they lived made of strips woven out of goat’s hair or sheep’s wool or a mixture of both, and its furnishings, such as rugs and cushions. They also made articles like men’s cloaks, saddlebags etc. that suited the Bedu migratory lifestyle. It is a craft that requires a high degree of dexterity and skill. The designs reflect the austerity of the natural environment of the desert and are governed by the wider principles of Islamic culture. Kuwait has a rich maritime tradition, of which boats were an important part. Dhows or huge wooden vessels were a specialty of Kuwait. Even in this age of super tankers, dhow building is a carefully preserved art, though its reduced significance has now restricted this activity to the Doha Bay area. Omanis are justly proud of their heritage and history, which goes back thousands of years. The main craft activities of the Omanis are ship building, traditional pottery, jewellery industry, copper industry and textile industry. During the sixth century B.C., Oman was known by the name of “Majan”– meaning the land of copper, or the land of ships, or the port of ships. Some Omani coastal towns like Sohar, Sur, Muttrah, Mirbat gained fame for the skill of their people in building ships. Several types of these are still seen in Oman like the Jalibut, the Sambuq, the Badan, the Ghanjah, the Baghlah, the Shashah and Al Boum. Oman knew the use of copper since early ages as indicated by the findings of the archaeological excavations in Wadi al Jizzi. Omanis were able to obtain copper from underground and innovated special furnaces to melt copper and established several industries like spoon making, cooking utensils and coffee flasks.. The person responsible for cleaning and polishing the copper utensils was known as “Al Saffar”. The Israeli occupation of Palestine, hinders the mobility of people and products, therefore, the Palestinian Crafts Centers and Associations in exile, such as those in Jordan and Lebanon, are the ones to participate in international cultural activities in Asia, Europe, U.S.A. and Australia. Their main objective is to provide jobs for the needy Palestinian women living in the refugee camps, and to preserve and revive the Palestinian identity through their cultural heritage, especially when they see the Israelis attribute such heritage to themselves. Hence, the Israeli occupation of Palestine, dictated a sort of split in the field of crafts, dividing it into two categories: I. Palestinian crafts’ centers and associations In the Occupied Territories of Palestine. II. Palestinian crafts’ centers and associations In Exile-Outside Palestine. I. Crafts Societies & Associations In the Occupied Territories: Many crafts’ societies and organizations spread in the main cities of the occupied territories known now as the West Bank (of Jordan River) such as : Jerusalem, Ramallah, Bireh, Bethlehem, Nablus , Hebron,etc.,… For instance, their activities are limited to local and domestic exhibitions, training courses and seminars within the occupied land. In Jerusalem: Sunbula, and al-Misrat, In Bethlehem: Palestine Heritage Center, In Ramallah & Bireh: The Society of In’ash al-Usra, In Gaza: plenty It is worth giving an idea about one example of these societies namely: The Society of In’ash el-Usra” in al-Bireh. Background: The Society of In’ash El Usra is a Palestinian voluntary organization established in 1965 in Al-Bireh, Palestine. The Society offers services and programs to the Palestinian women and other marginalized sectors of the community as a means of empowering them and enhancing the family institution, thus contributing to the development of the Palestinian society as a whole. Objectives: Enabling women to become financially independent and active responsible participants within their communities, by developing their capabilities and their skills. Providing high quality care and education for children. Lending support to victims of war, occupation, and social circumstances. Studying and preserving Palestinian Folklore and developing Rural Handicrafts and Industries. as in the other countries of the Gulf Cooperation Council, the state encourages and supports the cultural activities inside and outside the country. In 1998, the Ministry of Information and Culture was cancelled to be replaced by the National Council for Culture, Arts and Heritage. This governmental body became entrusted with the supervision on all aspects of traditional heritage. The Arts and Traditional Crafts Department in the National Council is in charge of supervising, training workshops, specialized symposiums, festivals and handicrafts exhibitions, etc. It promotes the traditional handicrafts in the country through the participation in various cultural events. It organizes annual local festivals such as: The Annual Doha Cultural Festival in the Heritage Village where many crafts are presented for visitors in a traditional environment. The World Day of Cultural Heritage where NCCAH exhibits the best products of various crafts, and organizes crafts workshops for training children, as well as specialized symposiums dealing with one aspect of the Qatari cultural heritage. The World Day for the Handicapped and those with Special Needs. The World Day for the Elderly and Aged. I. Local Activities: 1- In the year 2006: a- Participated in The Asian Sports Cup held in Doha-Qatar where they had workshops along with craftsmen delegates from five countries. b- Participated in the functions of the Tele-Communications Conference. c- Participated in the functions of the Energy Conference. d- Creating functions in the marketplace of Waqif where visitors watch craftsmen in the process of making their products. 2- In the year 2007: a- Opened a permanent ethnographic exhibition in Dukhan Club on March 13, 2007. b- Participated in the Cultural Week in Bayan Educational Center from April 29-May 3rd, 2007. c- Cooperated with the Youth Center for Art Creativity in its summer programme with an exhibition, and giving a training course on handicrafts for members of the center. II. International Activities: 1- In the year 2006: a- Organized a cultural week A Cultural Week in Cuba where around 5 crafts were displayed. b- Participated in the Muscat International Festival in Oman. c- Participated in the Cultural Festival organized by the Arab World Institute in Paris, in May. d- Participated in the Arab Art Festival in China. e- Participated in the Islamic Expo Exhibition held in London from June to September. f- Participated with traditional handicrafts in the function of the Gulf Night held in Oman in October 19, 2006. 2- In the year 2007: a- Participated in Palmyra Festival in Syria in May 17-19. b- Participated in the Qatari Week held in Algier in June 6-12, on the occasion of electing Algier the Arab Cultural Capital. Other societies and centers contribute to the development and promotion of traditional handicrafts such as: The Youth Center of Art Creativity Al Doha Youth Center The Art Creativity Center for Women Folkart Creativity Center Among the traditional handicrafts which remained alive and thus preserved are the Bedouin wool-weaving, the boat-building, the gypsum work, clothes tailoring, and some others. 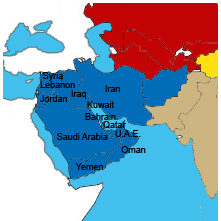 (officially, Kingdom of Saudi Arabia) is the largest Arab country of the Middle East.It is bordered by Jordan and Iraq on the north and northeast, Kuwait, Qatar, Bahrain and the United Arab Emirates on the east, Oman on the southeast, and Yemen on the south. The Persian Gulf lies to the northeast and the Red Sea to its west.It has an estimated population of 28 million, and its size is approximately 2,149, 690 square kilometers (830,000 sq.mi). Traditional Crafts in S.A. include: Weaving, Jewellery, Costumes, Nomadic Equipment, Traditional Weapons, Household Crafts. The main craft items of Syria can be categorized into brassware, silver ware, steel blades, jewelry, furniture, carpets and kilims, Intarsia (carved wood), textile and pottery. From the mid-thirteenth century until the beginning of the sixteenth boxes, vases and candlesticks were produced in Damascus for the European market and exported via Venice. Metal inlay is a highly specialized craft. The craftsmen use undecorated pieces which have been cast or wrought in bronze or brass by other craftspersons; only the decoration is applied in the inlay workshops. Silversmiths appear to have worked only in Damascus, Aleppo and Deir ez-Zor. Judging by the quantity of silver jewelry that still exists, the number of silversmiths must have been considerable. The art of producing the famous 16-18th century Damascus steel blades found in many museums was lost long ago. Recently, however, research has established strong evidence supporting the theory that the distinct surface patterns on these blades result from a carbide-banding phenomenon produced by the micro segregation of minor amounts of carbide-forming elements present in the wootz ingots from which the blades were forged. The United Arab Emirates is home to a rich cultural heritage that has been strongly influenced by its desert and oasis living people who were masters at surviving in one of the harshest climates on our planet. The skills of desert life are still held in high esteem by many of the UAE’s people and members of the older generation recall that they were crucial to their own survival. There are practically no archaeological sites in the U.A.E. which have not yielded some remains, however meager, of human adornment. Sites from the late Stone Age (6th-4th millennium B.C.) are often replete with beads of shell, bone and stone which would have once been strung in necklaces and bracelets. Marine shells and mother-of-pearl were sometimes artfully carved; imported stones like agate and carnelian from the Indus Valley (particularly from Gujarat, India) were highly sought after. Precious metals, including gold and silver, are present in small quantities and can be seen in the museums of Fujairah and Ras al-Khaimah. Stone vessels, particularly good for holding fatty or oily substances, began to be made in the area by about 2500 B.C. Most of these were manufactured from steatite or chlorite, a soft mineral found in certain parts of the Hajar mountains. During the late 3rd, 2nd and 1st millennium B.C. the U.A.E. had an extensive stone bowl-manufacturing industry which produced vessels in immediately recognizable shapes with very particular decorative patterns. Examples of such locally-made stone vessels have been found at sites in Iraq, Iran, Bahrain, Saudi Arabia, Baluchistan and the Indus Valley.